The Western Berks Fire Department frequently participates in community outreach events during which time our equipment is on display and personnel are available to answer questions about fire safety, department operations, and other information. The following community events have been scheduled and we look forward to seeing you there! where you live or contact the Western Berks Fire Department at (610) 678-1332. 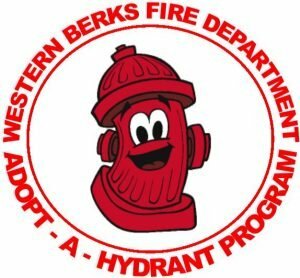 The Western Berks Fire Department is collecting information on residents who may require special assistance during an emergency incident in their home or during a community-wide disatser. The Special Needs Survey is a web-based tool that allows users to input their data into a secure database. The information is then used for planning purposes and is only used for emergencies. For more information on this survey, or to enter your information or a friend or family member, click on the icon below. 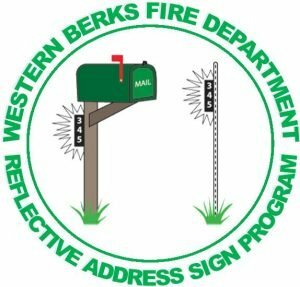 The Western Berks Fire Department is pleased to offer reflective address signs for homes and businesses in the community. These signs are designed to be mounted on mailboxes in rural areas to allow emergency service agencies easier identification of your home or business. Signs are customized by department personnel and are available at a cost of $17.00. If you are interested in purchasing one of these signs, please click on the icon below to download an order form.